Don't laugh. I never updated DAZ 3D from version 2.3. Fact is, I downloaded it the same time I download Bryce 5.5 years ago. Of the two, I found Byrce more intriguing, and pretty much ignored DAZ 3D. I have downloaded version 4.6, but still haven't gotten around to installing it, and that alone may be the answer to this problem, but, you tell me. I searched the forum, and could not find a topic where the problem that happened was discussed. Could be simply because it was discussed years ago, and scrolled away. After years of fiddling with Bryce, I finally decided it might be nice to import a person into a scene. Well, as some of you know, the only "person" that came with DAZ 3D v2.3 was Victoria v4. Also, she only has her volleyball outfit, and a casual outfit. I decided to use Bryce to make a picture gallery. I don't mean like an online gallery, but a hall with pictures on the wall. While figuring out what pictures to use, I settled on my photos from my 2010 trip to Yellowstone. I spent 3 days there STRICTLY to take pictures. Took hundreds of them, and dozens are worthy of showing off. So, I decided my hall must be huge, so the picture clarity remains somewhat intact. My final intent is a video where the camera travels down one side of the hall exploring each picture along the way, then back up the other side. So I'm not really worried about the haze issue. Of course, I could take it out, too. Rather than put up four walls and a roof, I made the building out of a single hollowed out box with a long hollowed out cylinder for the top and ceiling. By big and long, I mean 3450 Bryce units ... so long that, in default settings, one end of the hall when viewed from the other is almost too hazy to see. It's also 164 Bryce units wide. Then I added arches each consisting of two cylinders and a 1/2 torus. I placed these 150 Bryce units apart ... 23 in all. Of course I needed light, so I put up one for every other archway. That was good, so I started putting up the artwork. After I had one piece on the short wall at each end of the hall, I decided a human in the picture would add a good sense of the scale I intended. (Remember; I'm not trying to just build it big, but big enough that the photographs don't suffer too much degradation from being shrunk down.) I brought up DAZ 3D and had no problem at all putting Victoria into a pensive pose in her casual outfit. I exported her from DAZ 3D, and then imported her into the Bryce scene. That all worked, so I rendered it, saved it, and went to bed. It sat a few days, then, today I started working on it, to put up more pictures on the walls, starting with the place Victoria was staring at pensively. When I went to save, while it was saving objects, it failed with a "Generic error". After multiple attempts, I finally removed Victoria, and was able to save again. I guess I'll finish the scene, then throw Victoria back in as the last step. Is that typical, or a one time error? @CTippetts - interesting project. Since you're at Bryce 5.5, keep Studio 2.3 installed. I have Studio 2.3 for Bryce 5.5, Studio 3 for Bryce 6.0, 6.1 and 6.3; and Studio 4.6 for Bryce 7.0 and 7.1. As long as you don't install stuff where it wants to be but where you want it to be, the different versions won't bite each other. That error you report - hard to know what's the reason. Keep in mind that Bryce is a 32-bit application and as such limited to 2 GB - and it keeps everything in memory. At least 5.5 doesn't compress when saving, claiming yet more memory. If your computer sports at least 4 GB of RAM, I suggest to make your Bryce large address aware. Bryce can then address up to 3.2 to 3.5 GB. Victoria is rather memory intensive and if you put your photographs as wallpapers on 2D faces, that will occupy a lot of memory soon. Watching the memory usage with the Windows Task Manager is some help to see how memory is filled up. In any case, keep saving your work often and always with a new name (e.g. Myfile1, Myfile2, etc). What you do in Bryce is remembered up to 16 steps so you can undo. Unfortunately, this undo buffer cannot be emptied except by saving your work, quitting Bryce, restarting Bryce and loading your scene. There are some strategies to reduce what's in the undo buffer like saving your scene, add a cube, then Revert to saved; or as Rashad once suggested, add 16 cubes, then delete each one. Easiest and most reliable is quitting Bryce and start it anew. @Horo - Thank you for your quick response. Today I was going to install DAZ 3D 4.6. Thank you so much for warning me to stop. I'll be getting a new computer someday. Until then, I'm just going to push my memory/system limits until I do get something to blow over the edge. It's a 1Gig, Pentium 4. However, thanks to your response, I realize that the project I described is very likely to do that. I didn't know Bryce keeps everything in memory. What I described means, in the end, having about 50 high resolution images, and at 20 to 75 Meg each, I guess I'm going to need closer to 2.5 Gig just to fit the images, let alone the hallway and Victoria. So, I'm going to quit wasting my time on it ... that is; as I envisioned it. I'm going to scale it down, and use images that I don't care if they are degraded by shrinking, such as photos that have been turned into paintings. I'll save the Yellowstone project for the future. As it was, with 12 radial lights, I had to turn of shadows and such, (that I'm going to have to turn back on for the final video), just to get it to render in less than 10 minutes while I build it. I knew for the final video I would be facing over a 2 week render time, during which I would have to avoid my computer. Probably would have been stir crazy by the time it finished. I have a hard enough time letting a 1 hour render finish. The longest I ever did was a video of mountains eroding to become a logo. It took 5 days to render. I had another computer to use just for Internet and games while that one went, and I don't have that luxury today. 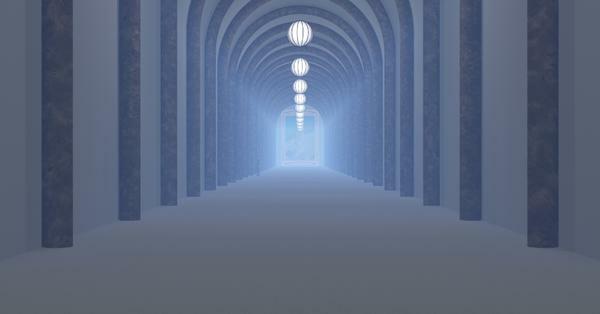 So I was also considering removing the radial lights, and adding some framework to turn the domed roof into a glass. I also appreciate your warning about letting DAZ products install in the locations they want to use, rather than force it to go where I want it to. However, I've learned that's true with many art programs. Learned that way back in the days of Corel Draw with all of its libraries. As for the "Generic Error", well, that's the only error I've ever seen out of Bryce. To me, having been a programmer, that does not speak of a poorly written program, but just the opposite. They covered all their bases for the program itself, so I never see errors they have a descriptive name or reference number for, and they did not get arrogant with system problems they could not control, by having the error message say, "This is your fault, not ours." It's also good to know that Victoria, herself, was not the cause of the error. Thank you for that. Love your galleries. Love your references and links. Thank you for helping to keep us all together. @CTippetts - you're more than welcome - and thanks for your kind words. Yes, 1 GB memory is a bit tight for the opsys, Victoria and photographs. Last night I decided to try to render this thing as it was at the failure point. I never got to putting the marble all over the walls, pillars, and floor. That's a fast rendering wood texture on the pillars I only put in to distinguish them from the Bryce grey walls. Since I was going to let it render overnight, I decided to turn on AAA superfine with soft shadows. At 2 PM this afternoon it still had hours to go, so I stopped it here. You can at least see what a 3450 Bryce Unit hallway would look like. That's Victoria about halfway down on the right. The picture on the end wall is of the Petrified Tree at Yellowstone, but you can't tell from this far away with all the haze. That's 12 radials bouncing light all over the massive amounts of polygons involved. Don't try this at home, kids. Anyway, now it's time to scale it down to a reasonable size ... later. Thanks again, Horo! Firstly, never EVER use Superfine rendering settings. They are the least friendly in terms of render time. Bryce uses 2 different render engines, one for Regular and Super and a completely different one for Premium. If you are using soft shadow effects, you will find that the Premium render setting will do it much quicker. Horo may be able to explain the ins and outs of that. Secondly, I'm not sure why you're getting hung up on the size in Bryce Units of your model. The size you render the finished picture at is what really matters in terms of quality. Without tiling your finished render, it isn't going to be any bigger than 4000px anyway and as you're thinking of making an animation, you aren't really going to be tiling the finished render. It would help your model building and your render times and Bryce memory issues if you could estimate roughly how many pixels in the finished render your photos will be and then reduce the size of the originals to that size (keeping your unedited originals of course), then import the re-sized pictures into Bryce. This will reduce the size of the files that Bryce has to process and make your job a lot easier and still get the best looking results. Lots of people make this mistake when using people and insisting on using the 2400 resolution skin maps for a figure that's only going to be 200px big in the finished render. Thirdly: You can edit the haze in the sky lab. If you go to the Sky & Fog tab and then click on the little cloud icon then choose the Atmosphere tab you will see settings for Haze. By altering the density and thickness setting you can have thick haze a long way away or thin haze right up close or any combination inbetween. @CTippetts - impressive hall. TheSavage64 gave you excellent advice. With soft shadows, do go premium. Plop render a part of the shadow transition with a low rpp setting, start at 9 or 16 and look at the noise you get. Then increase rpp by a step if not satisfied until you're happy. Usually, 36 or 64 rpp is enough. Each higher step doubles the render time. You can render soft shadows in regular but it usually takes longer than going premium and set the rpp. Superfine is really only for those that want punish themselves. If you go animation and have the camera moving, you can get away with a lower rpp setting. Again, don't waste time by rendering out a scene before you think you've got everything right. Use Plop render and just render the critical parts. For an overall impression, switch off all premium effects like soft shadows or set rpp to 4 or 9. You'll detect flaws like hoovering columns also in low quality. You’ll detect flaws like hoovering columns also in low quality. Hehe, ok then, columns that do not touch the ground firmly. You guy's!!!! Thanks for the belly laughs. @TheSavage64 - Yes ... I think that's the point of all of this, including the reason to send my render here. I went WAY too big. It's one thing to go big for a static image, but, what a mistake for doing a video. I knew about the haze and such. I think I even mentioned it. I kept it there for this particular render, because it does help show the scale of this, when you consider these are all Bryce default settings. When I look at my folder with my Bryce models and such, I don't just peruse the file names, because, over time, even if I was quite descriptive in my file names, I forget what the heck the thing was about. So instead I look over the thumbnails for the the rendered images, (for which I keep the same names as the BR5 file). I wanted to make sure, days down the road, I recognized this one as a failure. I only went for the Premium because I knew I was going to let it go overnight. Yes, I had already edited my radials for soft shadows. The first time I rendered this, (in regular render mode), those ribs I wrapped around the spheres that surround each radial light, (with no soft shadows), were casting a very distracting criss-cross pattern all over the walls and floor. (I think the spheres were about 80% transparent, with100% specularity, ambiance of about 45, and refraction about 160, to make sure most of the light got out of the sphere, yet the sphere would glow.) Then in a subsequent render, but before this one, I forgot that I turned off "cast shadows" completely. So, the only shadows the AAA had available to soften in this render, were from ambient reflected light. Just plain stupidity, I guess. Real waste of time and processing. [insert image of head hanging in shame here] At least I have my failure reminder. Tucking your advice for resizing the originals in my pocket right now. @chohole - Do you cringe every time I type "Byrce" instead of "Bryce"? No matter how much I proof read what I write before posting, EVERY TIME I read what I finally posted, I find errors. The Anasazi Indians had sand artists, that would draw elaborate sand drawings on the floor of the Kiva before certain ceremonies. They always made them as perfect as possible, except for adding one deliberate flaw, so the Gods would not think them vain. @Horo - Yes, the Plop render is probably why I didn't notice my columns sucked, (or Bisselled, Kerbied, Dysunned ... whatever). I forgot to include their base as one of those critical points you described. ALL YOU GUY'S - It's great to get so much advice from artists I truly admire and respect. TheSavage64, you need to get your gallery built and linked to here. I've seen your stuff, and it's wonderful work. Horo and Chohole, I spend hours in your galleries. I have never made it through it all, and that alone is marvelous of you. The work you three produce is inspiring to me to no end. That, perhaps, is another reason why I never made it through your galleries. I see something, get inspired, and run off to my reality canceling world of Bryce. By the way, Horo, that Dorsum is jaw dropping. A real piece of history, and I really admire how you know how to use it, and documented it so well. Why, yes you do. Thank you VERY much. Um, I don't know if it's my system or what, but I do have a problem viewing the default DAZ user galleries. It works, but I have about a two minute wait between clicks, during which time the screen is greyed out and the little arch thingy spins around. I guess that's why I spend More time at external galleries. YOURS, however, I will take that time. I do with Rashad as well.